Baton Rouge, LA – June 2, 2015 – Lamar Advertising Company (Nasdaq: LAMR) today announced that Sean Reilly, CEO of Lamar Advertising Company, is scheduled to participate in a question-and-answer session at the NAREIT Investor Forum in New York, NY on Tuesday, June 9, 2015 at approximately 8:45 a.m. (ET). The question-and-answer session will be carried live via audio webcast at the Company’s website, www.lamar.com, and will be archived for 30 days. Lamar Advertising Company is a leading outdoor advertising company currently operating over 150 outdoor advertising companies in 44 states, Canada and Puerto Rico, logo businesses in 23 states and the province of Ontario, Canada and over 60 transit advertising franchises in the United States, Canada and Puerto Rico. Lamar Advertising Company (Nasdaq: LAMR), a leading owner and operator of outdoor advertising and logo sign displays, announces that its board of directors has declared a quarterly cash dividend of $0.69 per share payable on June 30, 2015 to stockholders of record of Lamar’s Class A common stock and Class B common stock on June 16, 2015. 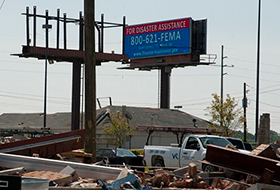 The electronic signs have aired targeted messages about everything from hurricanes and flash floods to natural gas shortages.